On November 24, 2009, a wild deer made headlines when it was spotted downtown Toronto near the city's largest bus terminal at Bay and Dundas. The incident bewildered the Toronto police Emergency Task Force and onlookers who were unsure how the doe managed to find its way to the heart of Toronto. The police were gawked by several local and national media outlets for their handling of the situation, which involved tranquilizing the animal and, after failing to subdue it, a taser shot was fired. The doe was in good health after the jolt and was released back to the wild. 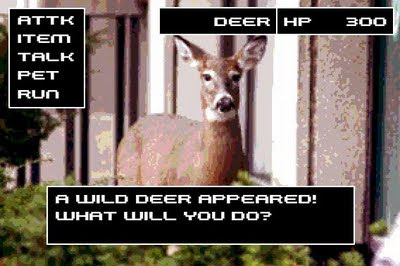 Local gaming website Toronto Thumbs created a flash-based game, called DEERTASE, which lampoons the incident by letting players assume the role of an officer of the law with the goal of subduing a wild deer that has been caught sauntering in the Downtown Core. "I just thought it was absurd that an officer would use a taser on an animal. If you look at the footage, you actually see the deer is just sitting there not bothering anyone. They basically tased her like she was an unruly thug." DEERTASE has been a big hit for the website, with the game receiving over 600 plays within the first 24 hours. No other game makes you feel so conflicted, so emotional. Haha yeah, it does deliver!